An eco-friendly office environment promotes well being in the workplace, reduces energy consumption, decreases your environmental footprint, and reduces negative environmental effects on the planet. 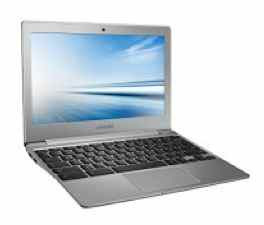 Choose to work on a laptop rather than a desktop computer when possible. Laptops use about 50% less energy than the average desktop computer. Don’t turn your computer system on until you need to use it. Turn your computer system off when you are attending a long meeting. Program your computer to go into sleep mode if you will be away from your desk for more than 20 minutes. Turn off your computer system at the end of the working day. Reduce the brightness of your computer monitor to save energy and to reduce eye strain. Program your printers, photocopiers, and fax machines to automatically go into power saving mode when they are idle after a specified period of time. Office equipment that is turned off but is still plugged in will continue to draw electricity called “phantom load”. Phantom load can account for up to 10% of the total energy usage in an average office environment. 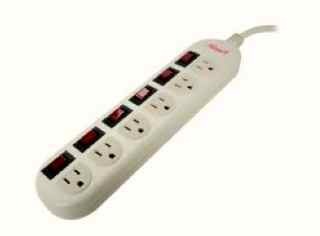 Use power strips with scanners, printers, shredders, and photocopiers. Once these devices are turned off at the end of the work day, switch off the power bar to stop them from drawing phantom power. Contact your local municipality to set up a recycling program for used printer toner cartridges and batteries from your office. Some toner manufacturers also offer free recycling options for their toner cartridges. Use power strips with the microwave and the coffee machine in your office kitchenette. Switch off the power bar at end of the day. Turn off the lights when they are not needed, especially in rooms that are not always being used such as boardrooms and meeting rooms. General lighting accounts for 40% of the energy usage in an average office environment. Replace incandescent light bulbs with more energy efficient CFL (compact florescent light) or LED (light emitting diode) light bulbs where possible. Use task lighting options where possible instead of lighting an entire room. Consider a "last out - turn off" policy for your office, where the last person leaving the office shuts off all the office equipment, small kitchen appliances, and lights. Make sure the heating and cooling vents in your office are not blocked. This will help keep your office heating, ventilation, and air conditioning system (HVAC) working more efficiently and save on energy consumption. Keep fans, lamps, and heaters away from the thermostats in your office to help keep your office HVAC system working efficiently. Use blinds and curtains to help keep your office cool or warm. In the summer close your office blinds to keep the heat from the sun out and in the winter open the blinds to allow the heat to come in. Use environmentally friendly office products when possible such as recycled paper, refillable pens, and non-toxic highlighters and markers. 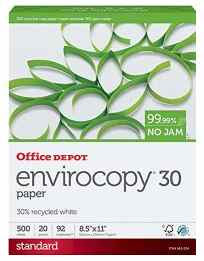 Use office paper that contains a minimum of 30% post-consumer content and is FSC (Forest Stewardship Council) certified. Paper that is FSC certified is manufactured in an eco-friendly way and is acid and elemental chlorine free. Reduce toner and ink usage by using draft mode for your low importance prints. 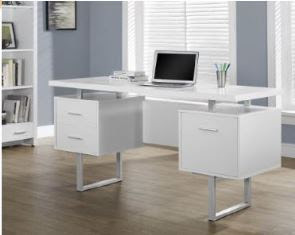 De-clutter and organize your office to reduce dust accumulation and to improve the air quality of your workplace. Use environmentally friendly building materials if you are planning an interior design renovation for your office. Encourage your office employees to bring lunch to work in reusable containers instead of plastic bags, and to drink beverages such as coffee from reusable glass mugs instead of Styrofoam cups. Install recycling kiosks in your office to separate waste from recyclable materials. Use non-toxic eco-friendly cleaning products in your office. Encourage your office employees to car pool or to use public transit when they are commuting to the office. 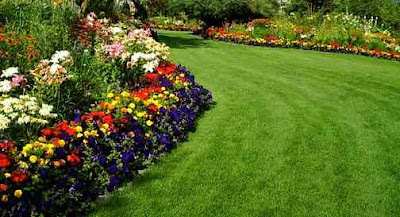 Whether you work from a home office, own a small business or a large corporation you can follow these environmentally friendly office tips to reduce the environmental footprint of your business, to decrease costs associated with energy consumption, to lower the cost of running your business, and to create a healthier workspace environment.